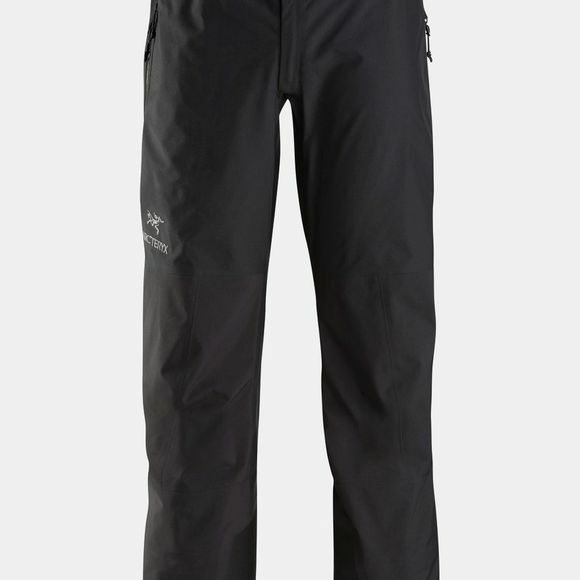 The Beta AR Pant delivers exceptional versatility. The N40r-X Gore-Tex Pro fabric is a lighter weight ripstop that delivers complete weather protection, a high level of breathability and surprising durability. The seat, knees and lower leg are reinforced with burly, abrasion resistant N80p-X Gore-Tex Pro. The careful selection and placement of each textile allows Arc'teryx to deliver a four season Gore-Tex pant that balances light weight, packability and protection from the wear inherent with rugged terrain. Developed for all around alpine use, a key element of the Beta AR Pant's versatility is functional motion across a range of terrain. The Athletic fit with e3D patterning provides freedom of movement with room for low profile layers. Articulation at the knees and the gusseted crotch combine to further extend comfort and range of motion. A lace hook secures the cuff to the boot to prevent the pant from riding up, three-quarter length side zips open up for easy removal over boots, and the waist adjusts with a webbing belt for a secure fit. Streamlining design should never mean foregoing essentials. Arc'teryx takes a use driven approach that eliminates the extraneous and pares features to the necessities needed to perform in specific conditions. The Beta AR has rugged Keprotec instep patches to protect from ski and crampon cuts, and the Cordura PowderCuff comes over the boot to help protect the pant and seal out snow. A simple zipped pocket at the hip holds small essentials.